Walker Books, 2000. 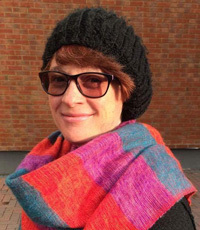 Pages: 238. I am only ten so this might not be that descriptive, just thought you should know that. (Don’t worry Toothy, you are doing great). So this review is about the Alex Rider book series by Anthony Horowitz. There are eleven books in the series so far. This review will cover the first book. The first book in this series brings you into a whole new world of spies – actual licensed teenage spies. In this book we are introduced to a fourteen year old boy named Alex. His mother and father both died in a plane crash when he was a baby, you might be thinking how did Alex survive? Well the simplest thing – he had an ear infection so he couldn’t go on the flight. So now Alex lives in Chelsea with his uncle Ian Rider and his house keeper Jack Starbright. His uncle is a bank manager and is never at home so Alex doesn’t know much about his job. But one day Alex is surprised to hear that his uncle has died in a car crash and had not been wearing his seat belt at the time. But Alex knows better – his uncle never took his seat belt off whilst in the car. On the day of the funeral Alex meets the head of the bank his uncle worked for, Alan Blunt. He finds out the manager’s driver is carrying a gun. Alex then sees a truck outside his house. Alex follows the truck to a car compactor. There he finds his uncle’s car and sees that it is riddled with bullet holes! After a daring escape from the car crusher Alex gets to show off his first grade Dan (black belt) karate skills. The next day Alex gets an invitation to the bank at Liverpool Street. Alex is then kidnapped and the truth is revealed… his uncle had been a spy and had also been training Alex his whole life! After a gruelling two weeks of training Alex is sent on his first mission to infiltrate Herod Sayle’s factory in Cornwall. There Alex finds out who murdered his uncle and many more secrets. The story comes to an exciting finale including a dramatic scene at the Science Museum. After a week of action, injury and pain, Alex realises that being a spy isn’t everything it’s cracked upped to be and vows never to work for M.I.6 again. That didn’t work out so well did it?! I really liked the action of the books, but it made me think about how it is not just fun and exciting being a spy, but it could really hurt you. It tells the story realistically about how Alex feels. I recommend this book to kids who like spies and action. As a child Anthony Horowitz always wanted to be a writer. Before he wrote Alex Rider, Anthony wrote a lot of other books such as Groosham Grange and Enter Frederic K. Bower which was published when Anthony was 22. I read about this in a book I borrowed from the library about the author, Anthony Horowitz: Creator of Alex Rider. Toothy reading Scorpio Rising, Book 9 of the Alex Rider series. Parents should be aware that as an action-packed adventure Stormbreaker does contain violence. However, the realistic depiction of violence as extremely damaging helps the reader to understand it’s negative impacts. 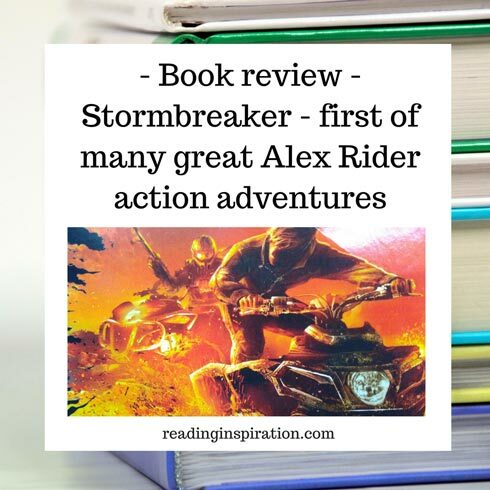 Have you read Stormbreaker or other titles in the Alex Rider series? What did you think? What are your favourite children’s action books? Toothy and I would love to hear your views in the comments below. If you are looking for great middle-grade fiction check out more books here. 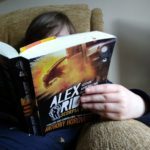 If your children love the heroic adventures of Alex Rider books they may also be interested in hero stories. Check out our Marvel heroes books and gift guide here.